Riggs and Murtaugh are at it again in this sequel to the original Lethal Weapon in 1987. When a red BMW crashes while they are chasing it, they discover the trunk is full of South African Krugerands. Their boss assigns them to protect a federal witness named Leo Getz to try and keep them out of trouble. When the witness reveals he has been doing business with South Africans, the story evolves into a fast moving chase. Los Angeles P.D. 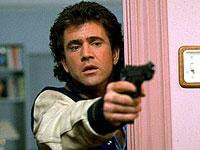 officers Roger Murtaugh (Glover) & Martin Riggs (Gibson) are back, and this time they are chasing a thug in a red BMW. When the car crashes, several million dollars in Krugerand - South African currency - spill out of the trunk. After Murtaugh is ambushed in his home by a group of South African thugs, they speculate that the vehicle they were chasing may be linked. When their captain assigns them to guard a witness (Pesci) in a drug case, they soon find out that the drug dealers the witness was dealing with are South African diplomats hiding behind their immunity to carry out cocaine smuggling. Riggs also discovers that one of the consulate employees is in fact the murderer of his wife! After the thugs kill a consul secretary Riggs was in love with, and several fellow police officers are murdered by the diplomats, Riggs & Murtaugh exact angry, bloody revenge against the psychopathic drug-dealing diplomats. South African smugglers find themselves being hounded and harassed by Riggs and Murtaugh, two mismatched Los Angeles police officers. However, the South Africans are protected by diplomatic immunity and so the duo are assigned to witness protection duty in an attempt by their captain to keep his job. It is only when this witness reveals to them that he has already dealt with the smugglers that the trouble really starts. Los Angeles police sergeant Roger Murtaugh and his partner, Sergeant Martin Riggs, are working on yet another drug related case. Soon after finding 1 million dollars worth of South African krugerrand in a crashed red BMW after a chase, Riggs and Murtaugh are assigned to keep an eye on Leo Getz, who is scheduled to testify in a case. There are people who don't want Leo to testify, and they are a group of drug smugglers led by Arjen Rudd, the minister of diplomatic affairs for the South African consulate. Rudd turns out to be the man that Riggs and Murtaugh are after in the drug case they were working on before Leo was placed in their protective custody, which doesn't look very protective when Leo is kidnapped by Rudd's right hand man Pieter Vorstedt. Riggs ends up falling for Rudd's secretary Rika Van Den Haas, who doesn't like Rudd. In a confrontation with Vorstedt, Riggs is told the true circumstances behind the death of his wife Vicky, who died in a car crash in 1984 the car crash was caused by Vorstedt, who was supposed to have killed Riggs. Minutes after Vorstedt tries to kill Riggs, Riggs finds Rika dead, and this sends Riggs over the edge.